Sometimes, you want a demo to be fun and in-yer-face. An all-out assault on the senses that you can use to showcase everything that's so great about your AV setup. For a sure-fire hit that'll wow visitors to your media room, I can't think of anything better than this sequence from Kong: Skull Island – the Blu-ray offers Atmos/TrueHD 7.1 or DTS-HD 5.1 mixes. Chapter 3 is where the magic starts, beginning at 0:27:11 – this sequence runs into the following Chapter, so you could use that as a starting point (but you will miss out on some monkey action...). The scene is set through the strains of Black Sabbath's Paranoid (one of many classic '70s tunes layered through the K:SI soundtrack), as the expedition starts its bomb-dropping experiments. A barrage of explosions around 0:28:43 ripple through the soundfield, some around your seating position, Tony Iommi's guitar solo comes to a climax and then… a flying palm tree takes out the chopper. It's a surprise for the characters and the viewer, and the jolt is helped by the Sabbath track coming to a halt and a dramatic silence briefly filling your room, before the downed 'copter heads across the screen in slow-mo, backed up a delightful bass throb and the return of Ozzy and co.
What next? Carnage. Kong's mighty paw heaves into view, swatting the chopper and instigating an aural storm of screeching metal, whirring blades, alarm beeps and yelping airmen, the soundfield pivoting around you as the craft spins. This scene builds to an LFE climax as Kong roars. The advent of 4K HDR panels has meant that 3D has fallen off the list of must-have features for most television manufacturers these days. However, the good news is that nobody seems to have told the film distributors about this – ensuring there are still plenty of new 3D Blu-rays making it to market. Released to baffling audience indifference last year, Luc Besson's quintessentially European space opera Valerian and the City of a Thousand Planets is one such recent release that I've returned to again and again in the few months since it made its debut on 3D Blu-ray. Shot in 2D, but conceived from the ground-up as a 3D experience, it is quite possibly the best showcase for the format since James Cameron's Avatar. It also boasts one of the most exacting tests of the capabilities (and limitations) of your 3D setup money can buy. Skip to 0:54:19 and strap yourself in as Valerian pursues a group of unknown aliens through the varied environments that make up Alpha Station, crashing through walls as he goes, the camera mainly remaining locked behind him.This all adds up to a dazzling display of three-dimensional depth and volume for your flatscreen or PJ; of perfectly rendered stereoscopic spaces for the camera to race though. Or, maybe, it's welcome to the nightmare world of crosstalk. The sequence only gets more taxing when the chase moves outside the station, with spaceships ducking between towers and down tight, twisting tunnels. If your 3D display is incapable of producing good black levels, all you'll experience here is an incoherent mess. But if it can, then the results are simply breathtaking. IT is not a reference-grade 4K disc, mostly because it wasn't created from true 4K source material. IT does, however, feature an aggressive HDR upgrade, and both HDR10 and Dolby Vision HDR masters. This sequence is tough for TVs because it features an unusually dynamic set of shifting contrast combinations. One minute a shot will be almost completely dark, the next it will be brightly illuminated by, say, an ignited flame. Even less extreme shots still exhibit pronounced light and dark juxtapositions. These varying average light levels against dark backdrops cruelly expose any weaknesses in an LCD TV's backlight system, revealing either light banding or haloing around bright objects, or general backlight fluctuations and clouding inconsistencies. And this sequence also proves challenging for OLED TVs, causing either sudden and startling shifts to grey or subtle vertical banding in dark areas. Another testing scene occurs between 0:42.24 and 0:46.22, and features the kids meeting up in a water-filled quarry. It's a bright, colour-rich HDR sequence with lots of tricky skin tones, natural colours and direct and reflected sunlight, making it a real test of a display's brightness and colour gamut capabilities. Those that struggle with brightness 'clip' detail in the skies and skin highlights. Or if their colour handling is limited/off, skin tones will look orangey or plasticky, while the green of the trees will look either muted or 'radioactive'. This sequence provides a fine example of DV's advantages over HDR10 too, with the DV encode offering noticeably more detail and colour precision – provided your TV is up to it. Regular readers will know I use this movie a lot in hardware reviews. And for very good reason – it's director J.J. Abrams' finest hour, and has the best opening sequence of any movie, ever. Add in the recent Dolby Atmos remastered sound on Paramount's UHD Blu-ray release and it's better still. From the opening Paramount/Spyglass/Bad Robot intro (0:00:10) you get full overhead sonic action thanks to the swelling Star Trek score. The music subsides and at 0:01:05 the beeps and whistles of the USS Kelvin's communications run across the overheads and through the rear channels, creating spacious and involving ambience from the outset. By 0:02:28 the Kelvin is under fire, and the Narada's angular cluster-torpedoes have an equally spiky and metallic sound that transitions across every speaker in the room. This soundmix has a rare clarity that allows you to pinpoint each effect within the maelstrom. Crew members spin into the silence of space and the entire soundstage shuts dramatically down to almost silence. Only the Atmos speakers have any work here, producing the faintest of echoes to deliver the illusion of vastness and emptiness at 0:03:10. The opening sequence's audio direction is truly masterful. As Captain Robau descends in Turbo Lift C 17, the camera is low, looking upwards to the huge, heavily damaged engineering hall (0:04:11). The sound maps the camera position and visual effects with precision, the height channels recreating huge electrical sparks in the roof high above. From roughly 0:10:00 onwards, Kirk Snr's fate is sealed as he sets a collision course. The orchestral score brings in a swathe of strings, underpinning the deep emotion of Kirk Jnr being born as his father dies. It's action, peril, heart-rending emotion, mass destruction and hope wrapped up in 11 minutes and 30 seconds of stunning cinematography and absolutely sublime audio. 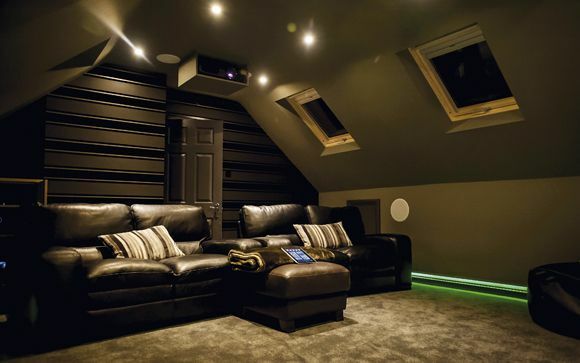 This is what home cinema is all about. La La Land on 4K Blu-ray is a little soft and noisy at times, but it has attributes that make it a useful test disc. Writer/director Damian Chazelle uses a bold palette of unusually bright colours throughout, which the disc's HDR and wide colour gamut really push. The one sequence that I often use runs from 1:13.03 to 1:16.10, where Sebastian performs in a band while watched by an increasingly dismayed Mia. The opening shot is pretty much the ultimate test of a TV's contrast performance. Sebastian and, shortly after, another band member are illuminated by a bright bluish spotlight against a near completely black backdrop. Given the enormous luminance range between the spotlight and blackness around it, this is almost always joined by stripes of unwanted light around the spotlights on edge-lit LCD TVs, or blooming light around the spotlights on direct-lit sets. It's also a good sequence to demonstrate the black level/local contrast advantages of OLED over LCD. We're then treated to a dizzying variety of vibrant, harshly lit colours, also against a very dark backdrop. This will reveal lots about the range and brightness of hues your display can render, as well as its ability to preserve bright and dark elements simultaneously without compromising the intensity of either. And it's one of the sharpest, cleanest moments in La La Land, bursting with detail – can your TV/PJ render 4K levels of clarity without producing stressy object edges or exaggerated grain? Dolby Atmos isn’t just for movies. Spatial audio can add a third dimension to music-only mixes too. However the choice remains limited with many only available inside expensive box sets. So where do you turn if you just want to sample affordable, excellent Dolby Atmos audio? My recommendation is Prometheus The Dolby Atmos Experience (Blu-ray) by Luca Turilli’s Rhapsody. If you’re a devotee of symphonic metal, then Rhapsody will need little introduction. If you’re not, imagine medieval choirs and riffing guitars, a sonic mash-up that channels Lord of The Rings and World of Warcraft. This is a triple-disc set, comprising two CDs and one Blu-ray, that typically sells for £17. Produced by Chris Heil, who has worked with Bowie and the Scorpions, the latter is a 70-minute ode to power chords and classical orchestrations. The Atmos listening experience is extraordinary. The Blu-ray opens with Nova Genesis, which lulls you with some monastery chants and guitar tune-ups, before an electronic surge sweeps up from the rear and collides with guitars that begin chugging left and right. Similarly, there’s nothing subtle about the shanty that is Rosenkreuz (track three) – it’s just one small mosh pit away from a Eurovision entry. But as guitars and organs rain down from on high, you’ll have to concede it’s a hugely entertaining concoction. Anahata (track four) is predictably pompous in a prog-rock sort of way, but the resolution in the Atmos mix leaves the accompanying CDs sounding positively gritty. There’s all sorts of odd instrumental intrusions here, including some Spanish flamenco, which become a lot more interesting in the wider Atmos soundstage. It probably won’t please the neighbours (unless you live next to Sharon and Ozzy), but Prometheus The Dolby Atmos Experience dramatically demonstrates just how immersive Dolby Atmos music can sound. We reckon it’ll leave you stomping your feet and calling for an encore. Whiplash is mainly about acting chops rather than spellbinding sound, but at the end of the film it gives you a genuine treat. The sequence begins at 1.32.25, as Miles Teller begins his drum routine for the song Caravan. It isn't about gut-wrenching bass or pin-you-to-the-seat dynamics. There's not even that much going on in the surround channels. Instead, this is a demonstration of timing, tonality and realism. As the rest of the band joins in, you should be able to follow every instrument – that scorching brass section, slick double bass and groovy piano – and they should all sound absolutely convincing because they've been lovingly recorded on the mix itself. And as a test for your sub this is in a different league. At 1.36.34, Teller delivers a thrilling sequence of kick drum strikes – around two dozen in the space of a few seconds. These are in the LFE channel and the very best subwoofers will record every strike as a distinct impact rather than a sort of dull buzz. At 1.36.50, J.K. Simmons tries to end proceedings but instead we launch into a truly insane drum solo which dies to crisp, clean cymbal strikes. The surround channels then come into play as Teller pushes himself to the limit, and by 1.39.00 you should be in a blizzard of distinct drum hits that peel away to a single snare. It builds again to the final blare of brass at 1.41.47 where the film ends. Sonic perfection right there. My go-to disc to assess picture quality after SDR calibration is the 2008 two-disc BD of The Dark Knight. While 'Scope ratio scenes are marred by edge enhancement, the full-field IMAX sequences are pristinely captured and mastered, none more so than the bank robbery play-out. At 0:00:53, we get an aerial swoop over Gotham skyscrapers that should look smooth without significant telecinic judder. As the camera zooms in on the central building, you can determine crushed or overexposed shadow detail by looking at how easy it is to differentiate one dark window pane from another. And if overscan is disabled on your display, at 0:01:09 you'll notice reflections of the filming helicopter at the top left of the screen. Up next, the Joker waits on a street corner, mask in hand. This frame should convey depth without looking flat: the lamp post to his left positioned clearly behind him, and the bag hanging by his right side jutting out in a three-dimensional manner. Properly calibrated, your display should present the correct hue of sunlit warmth on the building, a neutral grey on the road, and a very pale shade of blue in the sky. His silhouette against the brightness will quickly tell you whether you've set your sharpness too high (it should look natural, not etchy). Lastly, as the robbers' glide down a zip-line to the bank's roof (0:01:40) it should appear smooth without shimmering or tearing, which would indicate switched-on motion interpolation. Doug Liman's superb (and blackly comic) sci-fi has a surround sound mix to cherish from start to finish, but in this instance our focus is on the movie's very opening moments. There's no onscreen action here to excite – instead, it's all about bass. Press play from the Blu-ray menu and you're right into it – as the Village Roadshow logo flickers, a news show snippet gives us some background info, and the soundmix (DTS-HD MA) disgorges some unexpectedly low LFE notes that prep you for the incoming drama. At least, it does if you're listening through a suitably potent speaker system. Run Edge of Tomorrow through the speakers in your flatscreen TV and you'll likely think there's little going on beyond some wobbly visuals. The Blu-rays that will really test your system!